Overall Homes are your local building contractor on the Southern Fleurieu Peninsula. Steve Overall can plan, design and construct your new home or renovation to your specifications. Overall Homes is a member of the Housing Industry Association. Steve and his team are well experienced in the construction industry and know the rigours of building in the sometimes harsh coastal conditions around Victor Harbor, Port Elliot, Goolwa and all places in between. Building a home is one of the most important things you will do in your life so it’s important you deal with someone who treats that process with the respect you deserve and treats you as an individual and not just another job number. 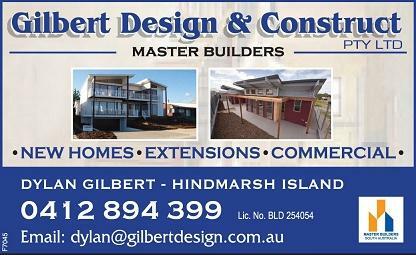 On the Fleurieu Dylan Gilbert at Gilbert Design & Construct is the builder that will do that for you. Dylan will lead you through the process from building design to handing you the front door key at the end. Gilbert Design & Construct don’t only build new homes but we also do home renovations, extensions and alterations and commercial building as well.